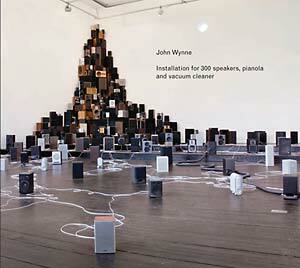 John Wynne's untitled installation for 300 speakers, pianola and vacuum cleaner is at once monumental, minimal and immersive. It uses sound and sculptural assemblage to explore and define architectural space and to investigate the borders between sound and music. There are three interwoven sonic elements: the ambient sound of the space in which it is installed, the notes played by the piano, and a computer-controlled soundtrack of synthetic sounds and gently-manipulated notes from the piano itself. Because none of these elements are synchronized, the composition never repeats. 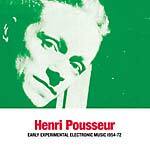 "Integrating composed sounds along with the sounds of the pianola, and in correspondence with the acoustical play of the space and the exterior environment, the installation is a sort of live organic composition of varying input and output. The constellation of elements at play in Wynne's installation engage the temporal and the environmental, composing them into an unsteady musicality: the delicate unfurling of sounds as they arise from different points in the room find both support and rupture from the trains passing by outside; the bulky mass of loudspeakers, with their plastic and wood surfaces and dusty odor, command attention while attempting to integrate with the pianola's sculptural melodies." 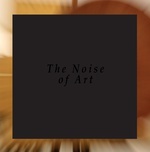 --Brandon LaBelle; This is an enhanced CD whose contents altogether include: an audio CD with a 45-minute recording of the installation; Bouncing Off The Walls, a split-screen video by Pete Gomes; and "An Aesthetics Of Pressure," an essay by Brandon LaBelle.